Ousted South Korean President Park Geun-hye has been moved to a detention center, where her only privileges over other inmates will be a slightly larger, more comfortable cell, according to prosecution and correctional authorities. The 65-year-old was assigned a single cell at the facility, a security official said, as cited by Reuters. As for the conditions Park is kept in, officials believe her ex-president status could entitle her to a larger cell than the standard 6.56 square meter unit. “I think Park will stay in a better facility. And she will have a bigger cell than those of others,” Reuters quoted Kim Kyung-soo, a retired prosecutor who interrogated two ex-leaders, Chun Doo-hwan and Roh Tae-woo, in a 1995 treason and bribery case. Apart from that, Park will have to obey the same detention rules as the others, such as getting up at 6:30am and going to bed at about 9pm. She will also be allowed to watch pre-recorded TV programs, cleared by the Justice Ministry, and will be served a rotating 2,500-calorie set of meals. Citing the prison food menu, Reuters reports her $1.30 Friday lunch will include rice with bean sprouts, kimchi, cabbage stew and seaweed. Park is well known for her chignon hairstyle, something she will have to give up behind bars: inmates can access a hairdresser, but only to cut their hair. Hair dye is also not allowed. At the beginning of March, the former South Korean leader was still living in the presidential residence Blue House. She then moved to a smaller, private home. She was taken to the detention center on Friday. At the center, her ID was checked, a short health exam conducted and mugshot taken. The former president will spend up to 20 days at the detention center, but the term she may ultimately face is 10 years. 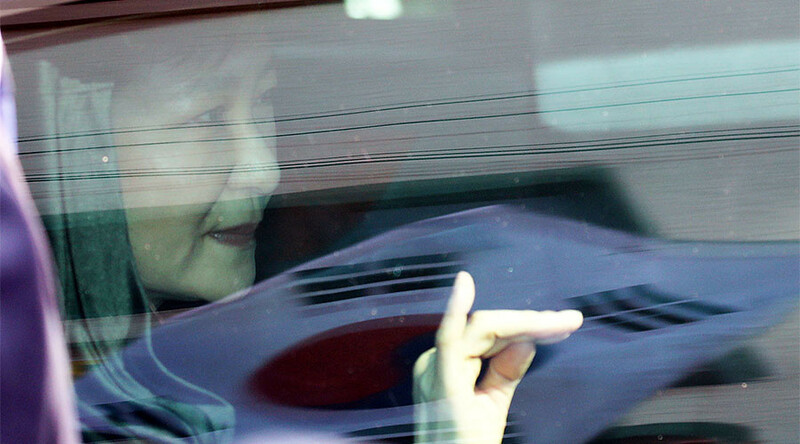 On Thursday, Park was questioned at a court hearing for nearly nine hours. A group of her supporters gathered outside the court, waving flags and shouting slogans. 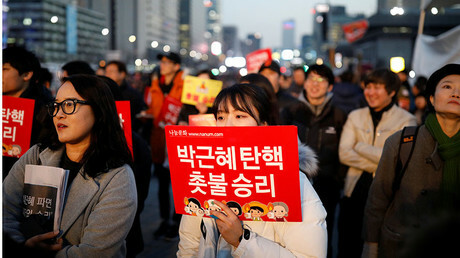 Park was impeached and is accused of conspiring with her friend Choi Soon-sil to obtain millions of dollars from South Korean conglomerates. Both women deny the accusations.